More than 4400 lifesavers compete for gold in Adelaide, South Australia. The 2018 World Lifesaving Championship was officially opened last night ahead of two weeks of competition that will see more than 4400 lifesavers compete in disciplines designed to hone their skills and fitness. 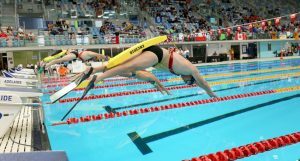 National teams from 44 nations start their campaign today at the South Australia Aquatic and Leisure Centre competing in the Simulated Emergency Response Competition before moving on to tests of swimming ability over the weekend. They will then hit Glenelg Beach to compete in the ocean events. Surf Lifesaving South Australia president John Baker said he was delighted the championships had attracted so many competitors. “These are the largest championships ever held and it is not just in the number of competitors, but also the number of volunteer officials and helpers,” Baker said. Baker said although the competition was fierce, there was an even more serious side to the championships. The championships began over the weekend with some 1000 masters competing in pool, ocean and beach events, and continue with National team and interclub competitions running until 2 December. The Australian team is targeting traditional rival New Zealand after having lost to the Kiwis the past three world championships. Australian team coach Kurt Wilson said the Australians were understandably strong at the ocean events such ironman and woman but were let down in the past by their skills in the pool, which includes events where competitors swim towing a heavy manikin. As a result, Wilson has built on his strong ocean team by adding more international pool competition and selecting specialist athletes. “At the 2016 World Championships we came out of the pool events in fifth and then we went to the German Cup this year and came away with top male, top female, top overall team, top pointscore and Currumbin pair Prue Davies and Matt Davis set world records,” he said. Wilson said he now had the talent to match it with the world’s best in the pool starting with Davis – one of the best lifesaving athletes on the planet. “To go to his National Championships and take nine gold medals from nine events is pretty phenomenal and setting five Australian records is pretty amazing. “He is the only guy who is really giving it to the Germans in the carry events in the 50m carry and the 100m medley (which he holds the world record in) and it’s pretty exciting for an Australasian athlete to be mixing it in that space. Competing alongside the traditional sporting powerhouses are nations still developing their lifesaving skills, including Iran, Sri Lanka and China. The national events will be live-streamed on Youtube and social media platforms.